Lightweight sleeves look breezy and elegant. Though strapless wedding gowns have been the most frequently-produced style since the 1990s, many brides are uncomfortable with revealing so much skin on their wedding days. Rather than finding a new dress after you've located the gown with the perfect detailing, add a pair of cap sleeves to the gown for a bit of modesty. Cap sleeves are fairly simple to construct and attach, and you can even add them to your gown using snaps so that they can come off after the ceremony. Try on your gown and measure across the top of your shoulder, beginning at the front of the dress and moving toward the back. Add 1/2 inch to each end to allot for seam selvages. Draw a line with this measurement onto the tissue paper. Measure your shoulder again, this time beginning where the midpoint of the first measurement lies and finishing a few inches down on your arm. This will be where the sleeve's hem lies, and so its length is dependent upon your personal preference. Represent this measurement with a perpendicular line that segments the first line in two equal portions. By connecting the end of the new line with the two ends of the first line, you will create a bell-shaped curve. This will be the shape of your cap sleeves. Cut out the tissue paper pattern and place it on your fabric. When selecting your fabric, you may either select a sheer net or illusion fabric or a satin, taffeta or lace to match your gown's fabric. Cut out the fabric, using the pattern piece as a guide. Finish off the edges of the sleeve, if the fabric is an opaque or easily unraveled material. Do this by folding the rough edges of the fabric under the fabric's right side and sewing around the entire perimeter. With sheer fabrics, such as tulle or netting, you will not need to do this. 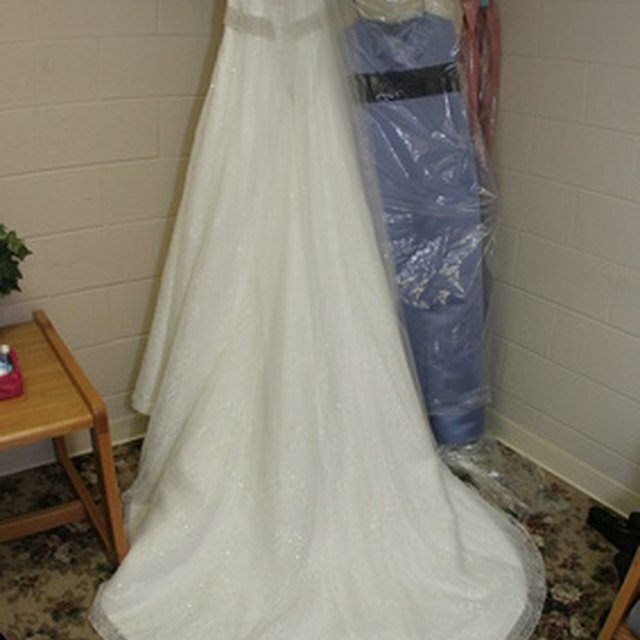 Pin the sleeves to the gown and try the gown on to ensure that the fit is correct. Either hand sew the sleeves to the gown's lining or sew two outward-facing snaps to each of the sleeves' right sides and sew two inward-facing snaps to each of the respective points on the gown's lining.